Obama announced historic Cuba visit. What it means. 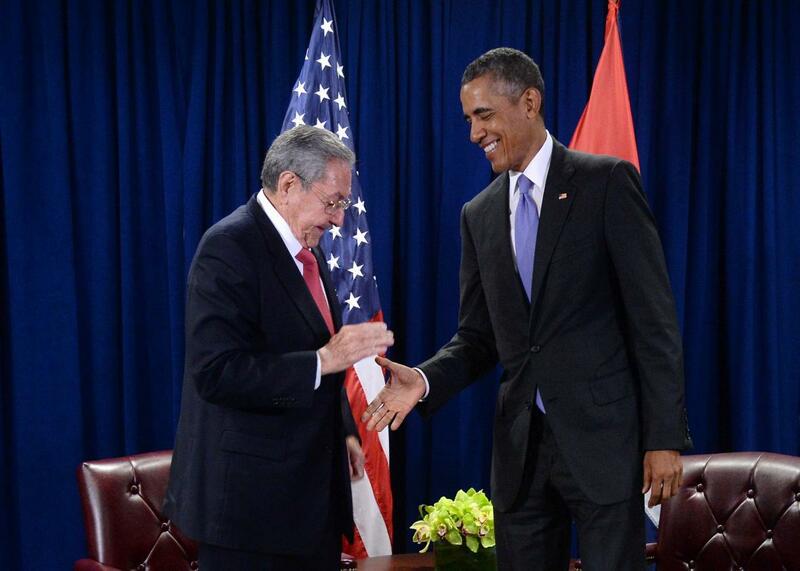 President Barack Obama and President Raúl Castro of Cuba shake hands during a bilateral meeting at the United Nations Headquarters on Sept. 29, 2015, in New York City. In a surprise move, President Barack Obama announced on Thursday that he will travel to Cuba next month, which will make him the first sitting U.S. president to visit the island in more than 80 years. The last and only president to visit Cuba while in office was Calvin Coolidge in 1928. (Jimmy Carter was long out of office when he visited in 2011.) Obama’s expected visit is just his latest effort to break the long-running diplomatic tensions between the United States and Cuba, following his groundbreaking announcement of the beginning of a normalization of relations with Cuba at the end of 2014. It’s now been more than five decades since the U.S. established an economic embargo that restricts most trade and travel with Cuba. Ever since the Cuban Revolution deposed U.S.-backed Gen. Fulgencio Batista and communist Fidel Castro took control of the island, 10 U.S. presidents had maintained a diplomatic freeze. That ended in July 2015 when Obama’s new initiatives went into effect, but many parts of the embargo—which requires Senate cooperation to undo—remain. White House press secretary Josh Earnest said in a statement that aside from meeting with Cuban President Raúl Castro, President Obama will “engage with members of civil society, entrepreneurs and Cubans from different walks of life,” in a further effort to push the country away from a restrictive state-mandated economy and toward a freer market. Conditions have improved since diplomatic relations were restored last year and the U.S. took Cuba off of its terrorist list. Travel restrictions for Americans have been eased and the two nations agreed to resume flights; Internet access has expanded, for the few who can afford it; and some political prisoners have been released. But the situation is far from perfect. According to Human Rights Watch’s 2015 report on Cuba, “short-term arbitrary arrests of human rights defenders, independent journalists, and other critics have increased dramatically” and “[o]ther repressive tactics employed by the government include beatings, public acts of shaming, and the termination of employment.” The Cuban Commission of Human Rights and National Reconciliation, a Cuban human rights group, reports that 8,616 Cubans deemed political prisoners were detained or arrested in 2015 alone. After visiting Cuba on March 21 and 22, the president will travel to Argentina and meet with the country’s newly elected president, Mauricio Macri, a moderate, right-of-center former civil engineer, whose ideology is considered to be a shift away from the leftist politics of his predecessor Cristina Fernández de Kirchner. Obama’s visit also will roughly coincide with the planned signing of a controversial and historic peace agreement on March 23 in Havana between the Colombian government and that country’s largest guerrilla group, FARC. Obama recently met with Colombian President Juan Manuel Santos in Washington as the two countries signed a new $1 billion aid package called Paz Colombia, to replace the decades-old, mainly military (and also controversial) former aid deal Plan Colombia.